Though more business owners have become familiar with the world of search engine optimization and competing in Google, many don’t realize just how competitive the local SEO landscape has become over the last few years. For example, in 2015 Google rolled out more than 500 changes that directly affect how businesses are ranked and indexed in their search engine. Notably, the mobile update in April and the RankBrain update in October woke up the SEO world and reinforced the overall importance of quality, relevance, and user experience as key factors for SEO success – both for local and non-geo-specific businesses. Then in September of 2016, Google released a local algorithm update which the SEO community coined “Possum”. The primary focus of this update was to display more accurate local search results depending on the user/business location, as well as enhanced filtering based on affiliation. We released a blog in September that summarizes the main takeaways for the Possum update. So what does this mean for local search? Relevancy – with your website content and link sources. Accuracy – with your citations and business listings. Credibility – through user generated reviews and ratings. In order to help you gain a better understanding of each of these ingredients and the role that they play in your local SEO efforts, I’m going to use our internal TechWyse campaign as a case study and go through some of the local search tactics we’ve deployed, and in turn, the results we’ve seen over the last few months. At the core of every local SEO campaign is your website and your Google My Business listing. For each of these, your business information and content needs to be relevant and accurate. With the correct “signals” in place on your website and GMB listing, you will be setting the foundation for success. 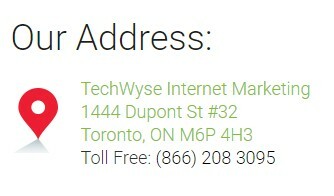 Since 2001, TechWyse has had a few different addresses in the Toronto area, so my first point of business was to ensure that the contact information on our website matched our GMB listing exactly – right down to the punctuation and formatting. Note: on our contact page there is a toll-free number, but this is a call tracking number. In the actual source code of the website it is the 416 number that is displayed, so this is considered accurate. 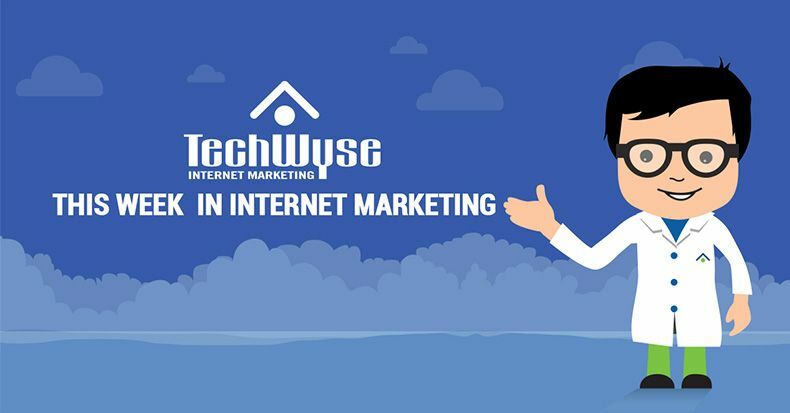 Being an Internet Marketing Company, TechWyse already scores well for the majority of these factors, but that’s not the case for every business. Jumping right into building citations before checking that your groundwork is properly laid out will eventually create headaches in the long run. Once I finished aligning our GMB and website info and checked over the respective ranking factors, it was time to move on and begin executing our citation audit and repair strategy. 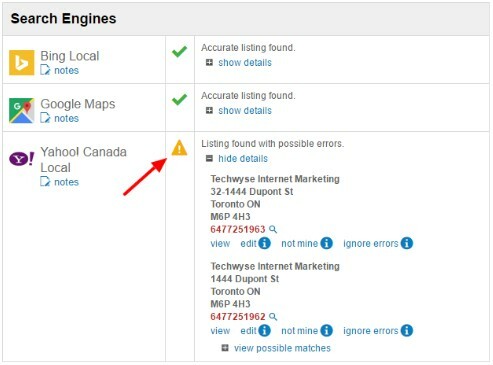 To preface the article, earlier this summer the search marketing team at TechWyse introduced an advanced local SEO solution called Local+. With over 12 months of research behind it, our new program utilizes API access from major data providers, directories and review websites to automatically sync business listings from a unified dashboard. This platform also contains a proprietary Listing Score engine that assigns a point value to citation sources based on authority and relevancy, as well as displays the average score by industry and top 95th percentile. As you correct your business information across the web, your listing score increases accordingly. This is truly groundbreaking stuff as the Listing Score provides us with a tangible metric to gauge the progress of our citation repair campaign. So to start off the audit process, I fired up our trusty Whitespark Local Citation Finder which generates a list of all citations indexed in Google that contain our business name and phone number. This spreadsheet was passed onto our team who then manually visited each link and made note of any inconsistencies. Needless to say, the process of auditing structured citations and business listings is time consuming and tedious, but an absolute requirement. Getting that baseline percentage of inconsistencies gives you a starting point – and a goal – to strive towards. 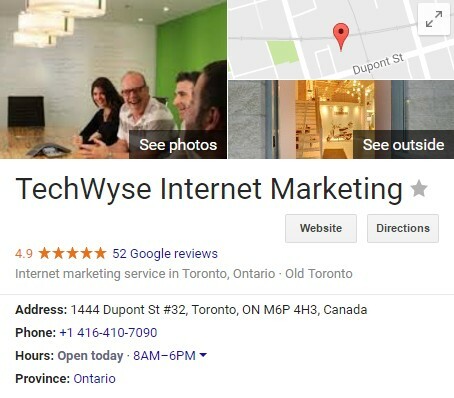 Once the audit was complete, I added TechWyse to our Local+ platform – which automatically populates the business as it appears in GMB (which we already know is correct). The platform immediately began to crawl it’s sources and match the NAP we provided with what is listed online, and display any errors discovered. As I’m writing this, it’s been a little over three months that our Local+ platform has been automatically syncing and creating listings on major directory websites, alongside my team and I spending many hours each month manually checking listings, submitting edits, claiming, verifying, etc. As of today our Listing Score is 435. Our starting score was 269 with an industry average score of 367. So all in all, it looks like our efforts are moving the needle in the right direction. We’re about halfway to the 95th percentile score of 643. When viewing the Listing Score history over time, you can see an initial bump in score followed by a steady incline month over month, with another little bump at the beginning of December. You’ll also notice a slight drop in score at the end of October, this was due to an irrelevant source being removed. With regards to finding a correlation between the increase in Listing Score and improved traffic, visibility and GMB performance, we’ve seen an 11% increase in local organic traffic (Toronto) year over year from the end of August (when we started) to the beginning of December. When viewing overall organic traffic growth, we can see bit of a dip after the two algorithm updates in September followed by a steady incline in organic traffic that’s almost parallel to that of the Listing Score. Over time, the information on listing websites can become out of date – whether that’s due to a phone number change, hours of operation change, location change or even business name change. If your business has been online for a number of years, you could potentially have hundreds of existing citations that need to be updated in the event of a NAP change. In Google’s eyes, it all boils down to user experience. There’s nothing worse than looking up a business and discovering that the information you found online is incorrect – especially if you’ve already punched the address into your GPS and driven across town, only to find out that it’s closed or has moved. This isn’t the type of experience Google wants to be giving their users, hence the importance of accuracy and consistency with your business listings online. 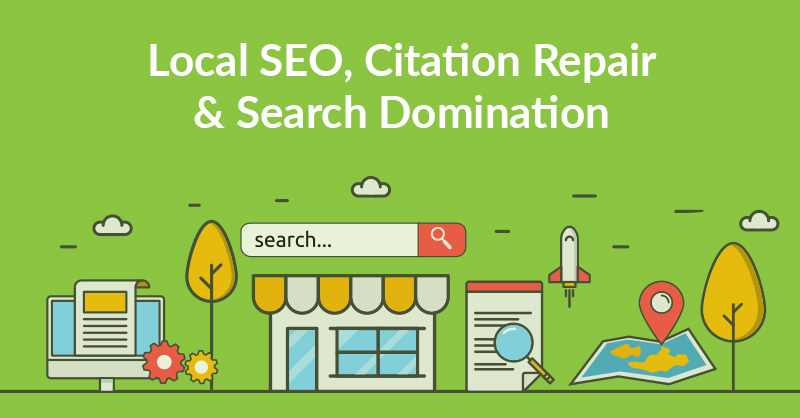 But remember, citation repair is only one piece of the local SEO puzzle. Having a cohesive plan that is full spectrum will ultimately win in the end. This includes building brand loyalty, generating authentic user reviews, and an indestructible trustworthiness that will eventually transcend algorithms and ranking factors. It is in this upper echelon of digital madness where your customers are so loyal and passionate about your business that they begin to market it for you. Over the last few years, review websites have begun to dominate local business search results, especially since the removal of ad blocks on the right side. Review websites along with social media profiles provide Google with reliable trust signals that help to determine the credibility of a business online. They greatly impact click-through rate, which directly impacts your ranking. 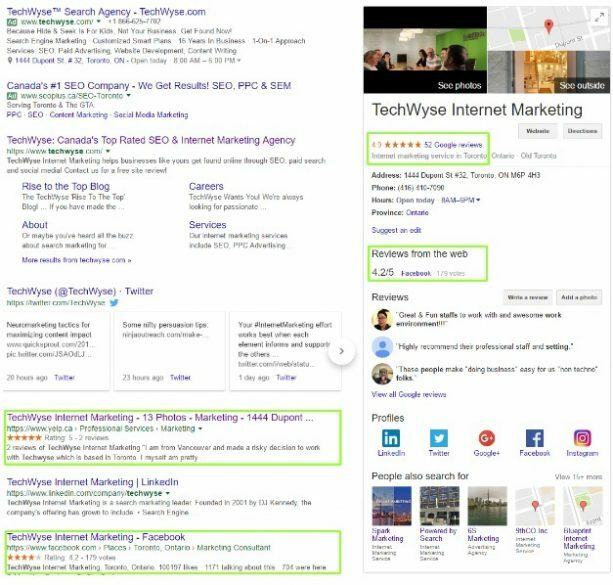 As you can see by the screenshot above, this isn’t an area where TechWyse needs improvement per say, but that being said, getting our clients to leave reviews is a regular part of our business operations across all departments – including SEO. Our account managers make it a point to ask our happiest and most satisfied clients to leave a review, and in exchange we’ll leave a review for them. This is a win-win and an easy sell, especially after a successful strategy meeting. This is really only applicable for B2B companies but it has historically produced great results – 95% of our reviews on Google My Business are from clients. This is the most basic form of motivation, but it still works quite well. 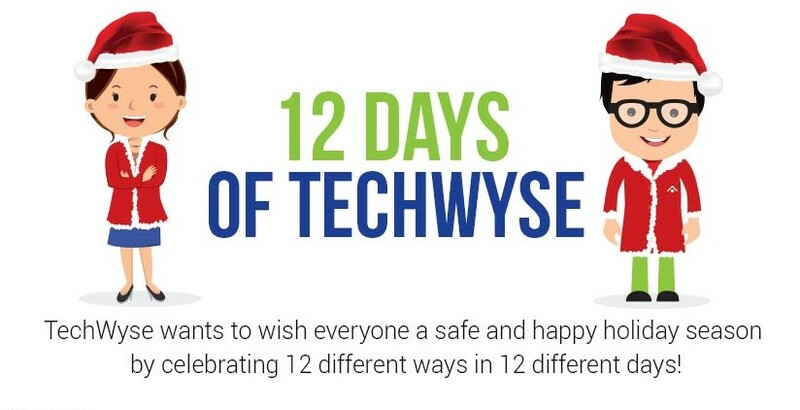 At TechWyse we have a goodie bag filled with various sought-after gift cards. When a team member gets a client to publish a review, they earn a giftcard. If you’re a B2C company, you can incentivize a customer by providing them with a discount in exchange for a review. This isn’t something we do, but my dentist does. He has postcards laid out on the reception desk reminding customers to leave a review on Google, with instructions on how to do so. And even in the exam rooms, he has a simple print out taped on the wall again reminding customers to leave a review. Is it fancy? No, but it works. Tip: if you want reviews left on your website to show up in search results with a star rating, ensure you have the proper Schema tags implemented. If there’s anything I want you to take away from this pseudo case study, it’s that skipping the groundwork is not an option if you truly want to succeed online. If you want to dominate the local search results for your business, you need to put in the work and be open to change as it happens. Local SEO is becoming it’s own marketing channel in a way, with various features and requirements that set it apart from organic and paid results. From your website to your listings to your reviews, ensure that potential customers are getting the best experience possible, and in return you will get the best customers possible.